Existing home sales decreased 4.9% in January, and the share of sales for first-time buyers continued to disappoint. The National Association of Realtors (NAR) reported January 2015 total existing home sales at a seasonally adjusted rate of 4.82 million units combined for single-family homes, townhomes, condominiums and co-ops, down from a revised 5.07 million units in December. January existing sales were up 3.2% from the same period a year ago. Existing sales from the previous month were down in all four regions, ranging from 2.7% in the Midwest to 7.1% in the West. 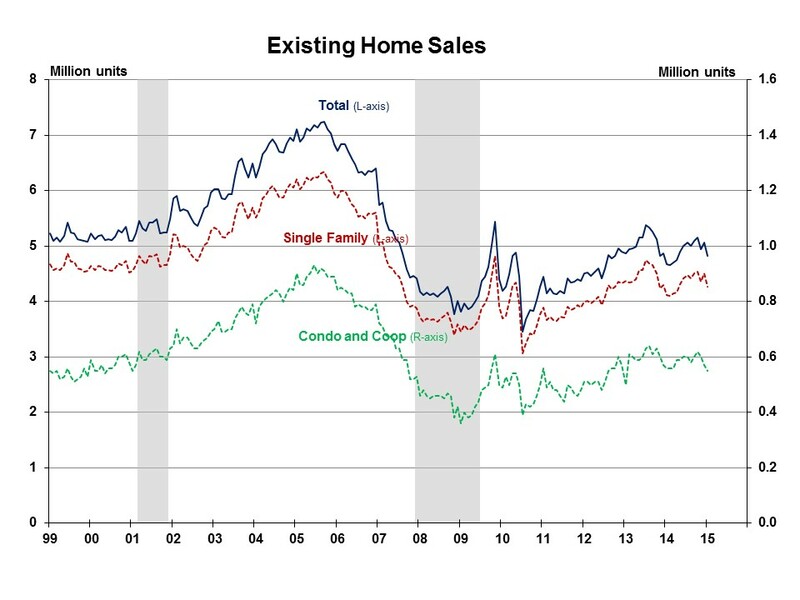 Year-over-year, existing sales were up in all four regions, ranging from 5.6% in the South to 0.9% in the Midwest. The first-time buyer share decreased to 26% in January, down from 29% in December and 31% in November. This continuing downward trend follows 2014 during which the annual share of first-time buyers fell to its lowest level in nearly three decades. Reports of easing mortgage standards will help first-time buyers, and a full recovery awaits their return to their typical 40% share. Total housing inventory increased 0.5% in January to 1.87 million existing homes. At the current sales rate, the January 2015 inventory increased to a 4.7-month supply, up from a 4.4-month supply in December. NAR also reported that in January the typical time on the market was 69 days, up from 66 days in December, and slightly up from 67 days during the previous January. NAR reported that 30% of homes sold in January were on the market less than a month, down from 31% in December and 32% in November. The distressed sales share January sales remained unchanged from December at 11%, and was down from 15% during the same month a year ago. Distressed sales are defined as foreclosures and short sales sold at deep discounts. January all cash sales increased to 27% of transactions, up from 26% in December and 25% in November, but were down from 33% during the same month a year ago. Individual investors purchased a 17% share in January, unchanged from December, but that share was down from the 20% share last January. Some 67% of January investors paid cash, up from 63% in December and 61% in November. The awaited withdrawal of cash investors will create more opportunity for first-time buyers. The January median sales price of $199,600 was 6.2% above the previous January, and represented the 35th consecutive month of year-over-year price increases. The median condominium/co-op price dropped for the sixth consecutive month to $198,300 in January, but was up 5.3% from the same period a year ago. The Pending Home Sales Index decreased 3.7% in December, so the decline in January existing sales was not a surprise. However, it is expected that existing sales will regain their upward momentum during 2015, hopefully supported by the much awaited recovery for first-time buyers.